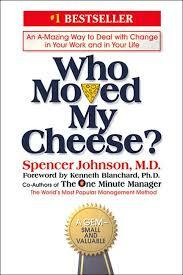 Remember the bestseller “Who Moved My Cheese“? An Amazing Way to Deal with Change in Your Work & in Your Life” authored by Dr. Spencer Johnson? I pulled it off my bookshelf recently and gave it a reread. This time though, I read it with a specific purpose. I’ve been thinking about how many communities have developed plans for natural disasters like floods, hurricanes, tornadoes and everything in-between, but have no plan for managing the loss of a major employer to a merger or acquisition. The National Climactic Data Center reports the U.S. has experienced 96 weather related disasters over the past 30 years with a combined economic impact over $700 billion. In contrast, there were 121 M&A deals reported in the U.S. in 2009 alone. Preparedness for a natural disaster certainly makes a lot of sense to help ensure a community’s residents are taken care of and the local economy isn’t devastated. But, I think developing a strategic plan for managing your community’s economy should a large local employer be involved in an M&A deal makes even more sense. What is the downside impact on your local economy if another company acquires or mergers with one of your community’s major employers? Are you prepared to absorb the impact? Would you even see it coming? How can you increase the probability that any rationalization of operations might mean more jobs for your community rather than less? How good are your strategic plans in guiding choices in an M&A “disaster” scenario? Will your community be calm or panicked? To stimulate dialogue, here is a review Dr. Johnson’s 7 Tips for effectively dealing with change translated into the world of economic development. Change Happens (They keep moving the cheese). M&A is a preferred strategy for foreign direct investment because it minimizes the financial risk of entering the U.S. market. It is also a strategy for companies in distressed industries to spread their investment risk across a broader revenue base. You can’t stop M&A any more than you can stop natural disasters. But, you can control how your community responds. And, you can affect the impact on your local economy with appropriate planning. What would happen if the major employer in your community left? Have you have made future plans based on having this cheese. Dr. Johnson suggests the more you need your cheese, the more you want to hold onto it. That could be a self-limiting behavior longer-term. Anticipate Change (Get ready for the cheese to move). There is a difference between productivity and activity. What would you do different if you were not afraid of losing your cheese? Would you take more control versus simply letting things happen? Would you invest in assets and capabilities that would make it more likely any consolidation assessment following an M&A deal would bring jobs to your community rather than take them away? Would you be investing more time and energy into finding new cheese for your community? The simple fact is that change will happen, and if your community doesn’t change it risks becoming irrelevant. Monitor Change (Smell the cheese often so you know when it is getting old). How strong is your relationship with the major employer CEOs in your community? How often are you meeting with them to discuss the future of your community and what they might need to ensure sustained profitability and growth? Are you investing enough time and attention to winning the Third Moment of Truth (reinvestment)? While many M&A deals are unanticipated and all are highly confidential, a close relationship with the CEOs in your community will provide important insights into how vulnerable your economic portfolio is to company relocation (for whatever reason). Don’t be like the book characters of Hem and Haw who became arrogant and believed their cheese would last forever. You need to have the systems in place to sense potential changes. You don’t want to let your cheese get too moldy when change is on the horizon. Adapt to Change Quickly (The quicker you let go of the old cheese, the sooner you can enjoy the new cheese). You have to let go of the past quickly so you can accept the new reality. It is important to have processes and capabilities in place to help displaced employees cope with change and quickly gain reemployment. How capable are your systems to handle the loss of a major employer? Could you quickly and efficiently address the challenges? What budget choices would need to be made if you lost the tax revenue? What future investment plans would be effected? It is much easier to think through these types of questions ahead of a crisis so you can concentrate on rapid deployment of your response plan when needed. The longer it takes to leave the past behind, the harder it will be for you to find new cheese. Change (Move with the cheese). Old beliefs do not lead you to new cheese. When you embrace change and begin to focus on the new possibilities, your community can make forward progress. Simplicity is an important enabler to facilitating change. When you have plans that are too dependent on a single set of assumptions (e.g. a major source of tax revenue), you will be tempted to focus on recreating the past by attracting a new large employer in a similar industry. But, that can actually be harmful to long-term economic prosperity. The better course of action may be to accept the loss and look to reinvent the community’s economic portfolio. What are the growing industries that could benefit from the recent availability of skilled labor? What changes can you make to strengthen the identity of your community (asset creation, infrastructure improvement, public policy reform) so it is competitive for capital investment? How can your community emerge more relevant and competitive as a result of the change? Enjoy Change (Savor the adventure and the taste of the new cheese). There is always new cheese out there whether you recognize it or not. Your job as an economic development professional isn’t simply to manage the daily problems associated with ensuring today’s economic well-being. It is also to look forward and pay attention to where the economy is headed and then lead your community to sustainable success. Your job is about painting a picture of what the new cheese looks like so your community will want to pursue it and will enjoy the journey. Be Ready to Quickly Change Again and Again (They keep moving the cheese). Change imposed is change opposed. It is important to recognize that change is the constant in economic development just as it is in all parts of life. Don’t feel like it is being done to you. The best thing you can do is accept the fact that change will happen again and again. Once you come to terms with that fact, establish processes that take the fear out of changing and put the fun into the journey. Effective scenario planning is one way to help your community deal with the inevitability of change. How current is your economic disaster plan? Any idea how moldy your community’s cheese is right now? Are you investing enough in finding new cheese that can sustain your community’s economic prosperity? Are you focused only on American cheese, or have you opened your strategic plans to the possibility of International cheese as well? I hope you enjoyed the post and I hope it stimulated some thoughts on the need for a) an even stronger partnership with the CEOs in your community, b) a contingency plan in case an M&A deal moves your cheese, and c) the creation of a forward looking plan that is constantly sensing and seeking new cheese to drive your community’s economic prosperity. Leave a comment with your thoughts and stories. I hope the folks in Michigan read your blog. While Detroit is sucking win, what is the plan to develop all the lake front land the state has been blessed with. Where are the incentives to build retirement communities, hospitals, technology campuses, etc. I live in a city without a plan, Philadelphia. My question is: Does planning have to shut down due to tight budgets, or should community planning be part of the culture vs. always counting all the nickels and dimes? Ed – Great post here. I remember the book well, Johnson’s seven steps are a great platform for thinking about economic development and the frame through which to act on it. I think points four and five are especially apropos to our great state, as they compel the need to think about old things (industry) in new ways. Having led the tourism industry in Long Beach,. CA. during the economic turbulence of the 90’s taught me some valuable lessons. Always be prepared! Do Not, I repeat Do Not put all your eggs in any single basket. Diversify! Understand and identify your community assets and strengths. Match them with a variety of businesses and industries that, in total, can continue to perform throughout an equal variety of economic challenges. Gone are the days when a community could invest in a single industry and be confident – the automobile inustry, technology or defense.Look at Michigan. Long Beach was layered with defense industries and when the Naval Station and Base closed, thousands of jobs were lost. It took years for the economy to find new footing. A diversified economy will better weather the economic turbulence, no matter what the challenges. Think strategically! The global economy is too demanding for any one or community or government to be complacent with what is working today. Build on your Primary Strength then Co-brand your Secondary Strengths with your Hierachy of Destinations. So if you’re a troubled city like Detroit, you need to re-focus your primary strength – Motor City – and re-invent the future of the motor industry with your Big Three auto companies. Then go global as the World’s Motor Capital. With regard to your secondary strengths, Detroit then needs to co-brand with its hierarchy of destinations eg. State: Michigan – The Great Lakes State, and Country: America – Home of the American Dream. The above strategy was inspired by the natural world where trees that survive severe storms all tend to have one Tap Root that runs deep into the ground – a form of anchor – plus a base of shallow roots – a form of stabiliser. But without the Tap Root, very few trees would survive hurricanes or tornadoes no matter how wide their base of shallow roots. My cheese flown, so I am looking for a new and big one! Ed this is a great post, thanks I learned a lot. Alvaro – Thanks! I am glad you found it a worthwhile read. Please check out some of the other posts when you get a chance.